The StressChecker for health, fitness professionals and sports trainers is a biofeedback product represents a valuable tool in your daily work with clients. Whether you are a doctor, physiotherapist, psychologist, stress counselor, dietician or masseur, etc., the StressChecker shows you and your clients how their lifestyles are affecting their health. It provides you with objective evidence of what helps them to relax and what causes their stress levels to rise. As a sports coach or fitness trainer, you can use the StressChecker to gain a clear insight into the physical condition of your athletes or players. This provides you with the information you need to decide on the right intensity of individual training sessions for optimal effect. 1. The 'Periodic Measurements' function enables you to monitor the stress level and physical/mental fitness of your clients/athletes/players over time, whether for treatment, training or preventative purposes. 2. The 'Experimenting Freely' function allows you to gain real-time insight into the effect of a particular relaxation technique, such as calm breathing. You can do this reading as long as you like. 3. The 'Specific Measurements' function enables you to assess the effect of things like a walk in the woods, a business meeting and after a relaxing massage. All measurement results of all your clients, athletes, players, are stored separately. 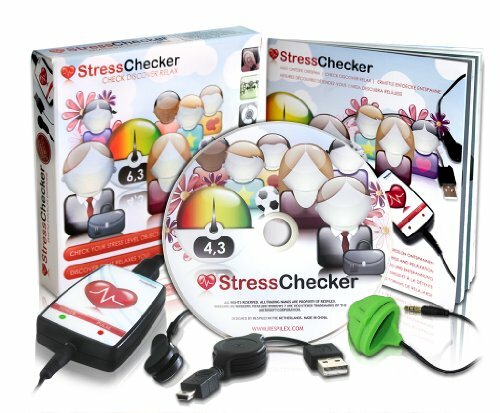 The StressChecker products are not suitable for people suffering from heart failure, frequently occurring irregular heartbeat or having a pacemaker or for people who are currently taking medication for heart problems or other medication that influences the heart rhythm since this could impair the reliability of any results. The StressChecker comprises the license for three PCs or for three Windows 8 & 10 tablets of a Windows-based program on DVD, a heart monitor. It also includes a handbook, prepared especially for you as a coach, trainer or healthcare professional and a second fingertip sensor, one of which has been specially designed to work under bright/artificial lighting conditions and also fits onto larger fingers. Shows the impact of your clients' lifestyle on their stress level. The measurement method is based on pulse and heart rate variability (HRV). In addition to already being used by many consumers, the StressChecker products are also popular among doctors, physiotherapists, psychologists, sport psychologists, sports trainers and personal coaches, work-life balance and stress counsellors, dieticians and companies offering employee lifestyle programs. The StressChecker products are used by health insurance companies in preventive and health-awareness customer programs. If you have any questions about this product by Respilex, contact us by completing and submitting the form below. If you are looking for a specif part number, please include it with your message.